Fail: While I’ve been on plenty of online dates, I’ve never had any luck with meeting people using the OkCupid Locals App. There are countless times where I’d look through profiles and suggest meeting a guy without a response from him in return. And if a guy was interested, he’d totally disappear. After awhile I felt rejected and thought I should give up on the app altogether. But that all changed last Saturday when I was out with a friend for drinks and dinner. On a whim she suggested I cruise through the app to see if anyone was out. Within an hour or so I was exchanging messages with a few different guys, and ended up meeting one of them later that night. My approach didn’t change; it was just a different time and place. I’m not sure anything will happen with this new guy, but when it comes down to it I snagged a date when I was about to totally give up. While this technically this isn’t a fail, it would have been if I had let my feelings of rejection stop me from trying the app again. Fab: It’s easy to think that when you sign up for a dating site you’ll instantly get a ton of messages and meet the sweetie of your dreams. And while there’s no harm in being hopeful, you have to be realistic, too. Keep in mind that finding love might take a week, month, or maybe even a year. It’s kind of like getting glitzed up for a night on the town. Even though you look your best, ready to mingle and flirt, you might end the night without snagging any digits. Nothing was wrong with you; it just didn’t happen that night. But you always have the next Saturday night to look forward to. The same applies to online dating. Sometimes it takes a while to strike gold, so don’t be so quick to raise your white flag. And though it’s never a bad idea to switch things up, a change in your approach isn’t always necessary. Instead, simply let luck run its course. Patience is key. Finally, keep in mind that there are so many different reasons you’re not getting as many responses as you’d like. At the end of the day, your inbox doesn’t have to be bursting at the seams. All you really need is a message from the right one. Remember: Don’t let rejection ruin your confidence. The old saying is true — if you don’t succeed, try and try again. 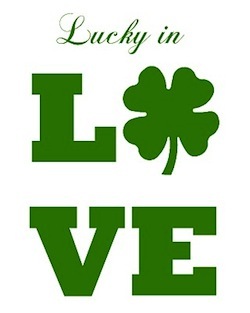 Or maybe, you just need a bit of Irish luck.